Please also sign our petition to stop development in Island Gardens. Or read our briefing document. We are a not-for-profit organisation set up by local residents of Canary Wharf and the Isle of Dogs. We're here to let you know about local development threats that arise from time to time as well as to look after and improve the Gardens for everyone to enjoy. We also arrange community fun-days and events in the Gardens. Friends of Island Gardens is officially recognised by London Borough of Tower Hamlets Council. From time to time we will challenge the council where we believe it is in the public interest to do so, but for the most part we endeavour to work closely together with the council officers and local councillors to ensure Island Gardens is well maintained and that community events can take place in the park for the benefit of residents and visitors. Commemorating 100 years since the end of the First World War. If you are a school or youth group and would like to be involved in the ceremony, please email us. Would you like to get involved? Can you help us out on the day or in advance of events with set-up/clear up or by manning a stall? Join our Event Volunteers Group on Facebook. 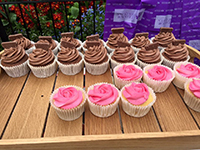 We offer some subsidised stalls and other un-subsidised stalls depending on the event we are producing and the sponsorship we have been successful in securing. If you're an interested stall holder please also register your interest here and this enables us to approach you if we want to invite you. 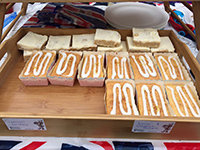 We will contact all registered stall holders approximately 3 months in advance to invite stall holders to our events. 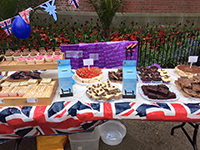 To book a stall at one of our events, please contact events@friendsofislandgardens.co.uk. We have opportuntities for companies to sponsor specific events as well as to sponsor the work of our association. For more info, please email sponsorship@friendsofislandgardens.co.uk. Here are some examples of the events we've run in the past. If you would like to become a Friend of Island Gardens, it costs just £5 for an individual or £7.50 for a couple living at the same address. If you'd like to support to a higher level, we also offer patronage and company membership from £25. We accept all credit and debit cards and there are no fees to pay. Apr 2018: We've put together a briefing document to help members, councillors and the media understand why we are still fighting the development at Calder's Wharf. Download the briefing document as a PDF here. Jan 2018: Please see our letter to the Secretary of State for Communities & Local Government. Aug 2017: Please see our open email to LBTH council officers. We are trying to prevent developers building on the Calders Wharf site, that we believe is still publicly owned and should be restored to being part of the gardens for the public to enjoy. We are petitioning the council (and government if necessary) to intervene. ...and it would be remiss of us, not to let the council have the last word and include this response from the Chief Executive of Tower Hamlets Council. It is with deep regret that we post this after months of hard work. We have been left with no choice. After months of planning, meetings with council officers and the backing of a significant number of local businesses, it is with profound regret and sadness that demands of Tower Hamlets Officials, have forced us to announce the cancellation of the Kids Karnival intended for Saturday 30th July 2016. We intended to have bouncy castles for all ages, rides and a sand pit for youngsters, a Punch & Judy Show, police and fire brigade presence together with other participants and with stalls selling a variety of goods. We were to have a superb raffle with some dazzling prizes donated by local people and companies. Unfortunately our professional event organiser could not cope with demands made of him by Tower Hamlets Arts & Events Department, and felt they were disorganised and not very efficient; And, for him to go ahead would have meant him charging us a lot more money than we could possibly afford. Tower Hamlets gave us the go-ahead for this many months ago, and any concerns or demands could and should have been made to us months ago. The first challenge with them was over the provision of temporary toilets (needed for the large numbers of expected children) they have always provided these previously. This time they told us to go out and hire them ourselves and pay for them. We have no public toilets on the Isle of Dogs yet, local Council Tax Payers are expected to pay towards the upkeep of 17 (yes seventeen) public toilets north of the East India Dock Road, and they should hang heads in collective shame. To rub salt into our wounds we only found out last week they were promoting an event in Island Gardens yesterday, which did not meet the standards meted out to us AND not advertised anywhere, nor even notified to us. Last year we commemorated 120 years of Island Gardens with a fabulous community event and memorial plaque in memory of Will Crooks unveiled by John Biggs Mayor of Tower Hamlets. Will Crooks fought hard and long to get Island Gardens laid out for the public good, he said when opening same in 1895 “This should be a safe haven for mothers and children to come to, and regard this park as your very own”. Perhaps Tower Hamlets Council might care to reconsider their approach to local park and communities and put their (or rather, our) money where their mouths are. We have approached John Biggs Mayor of Tower Hamlets for a meeting but have yet to be successful in arranging this. The Friends of Island Gardens would most sincerely like to thank all our supporters and friends in the community for rallying round to help and for their kind donations of prizes, money and time. 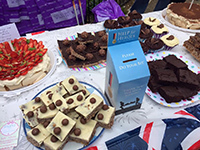 Our Bake for Heroes cake sale event on 2nd May raised a fantastic £209.54 for Help for Heroes and that's before adding £56.50 raised from sale of Help for Heroes merchandise. 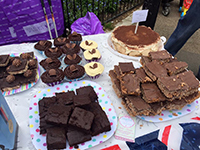 Thank you to everyone who came along to buy or who donated a cake.